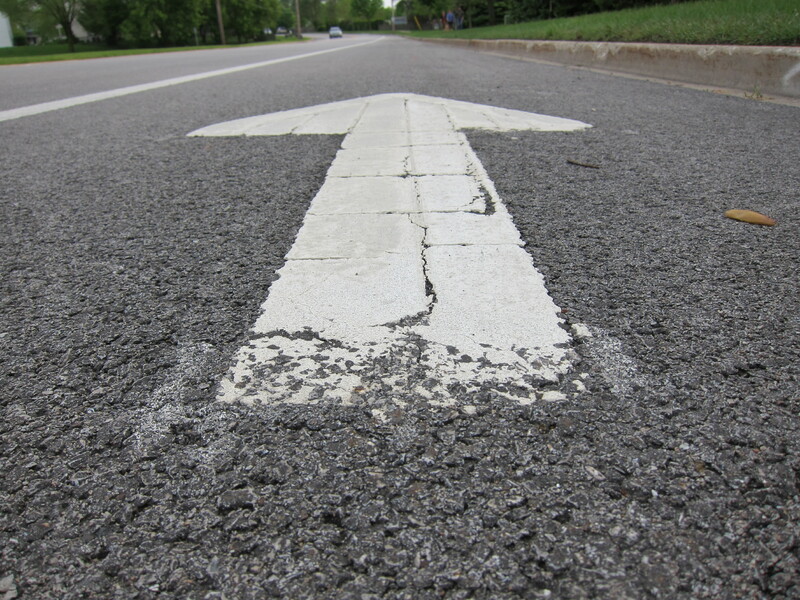 Part of the difficulty in making the cycling and running world safer for millions who run and ride is in stretching the public imagination to see what is possible when people really put their minds to the issue of safe, simple solutions for public trails and bike lanes. 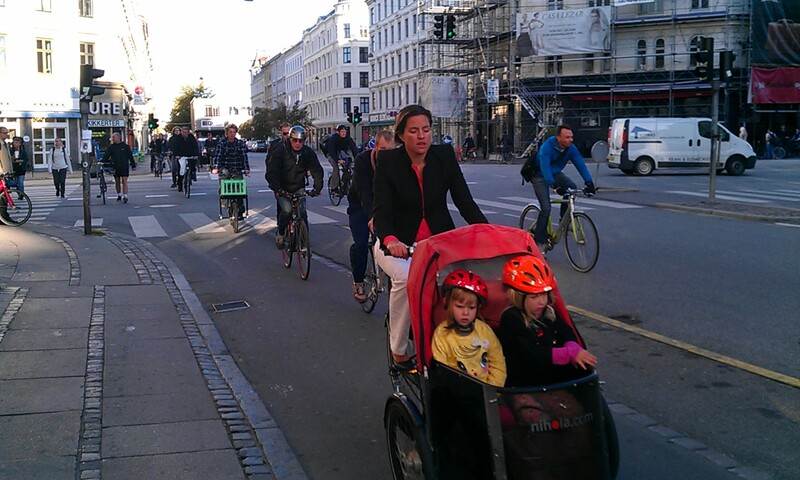 “In the last decades, Copenhagen has gone bike-crazy. The wide bike-lanes are filled with thousands of bicycles all day long. 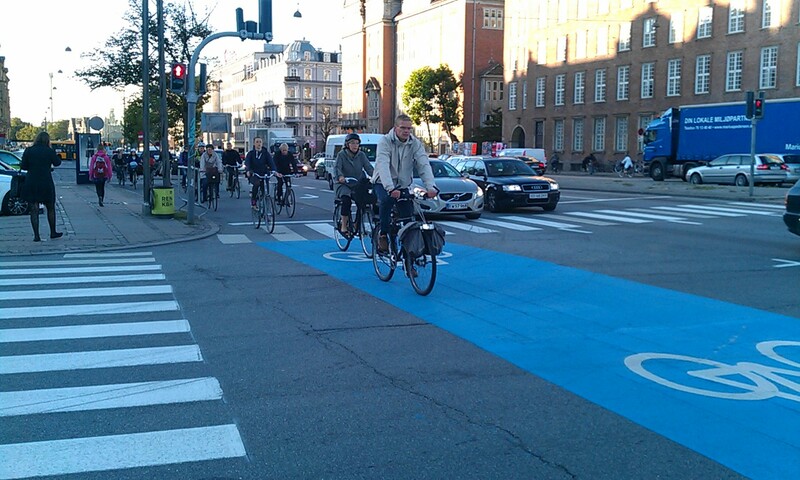 Copenhagen can now compete with any Dutch town on bicycle density. They have set the bar really high for any other city that wants to call itself a “green city”. Copenhagen Bike Detour. Click to enlarge. Photo by Keith Hauser. 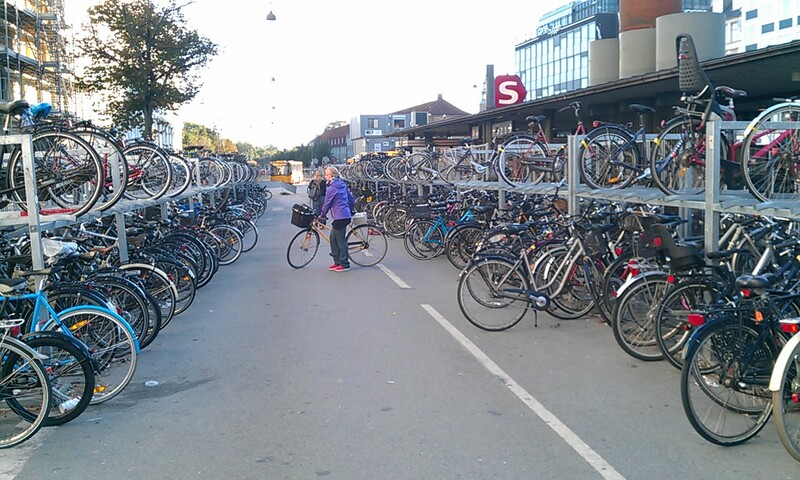 Copenhagen Bike Parking. Click to enlarge. Photo by Keith Hauser. they have 2500 bikes. The original idea was to reduce general bike theft by making these available. Copenhagen Kids. Click to enlarge. Photo by Keith Hauser. What a wonderful example of a city and country that has taken the initiative to make cycling safer and more practical for its residents. 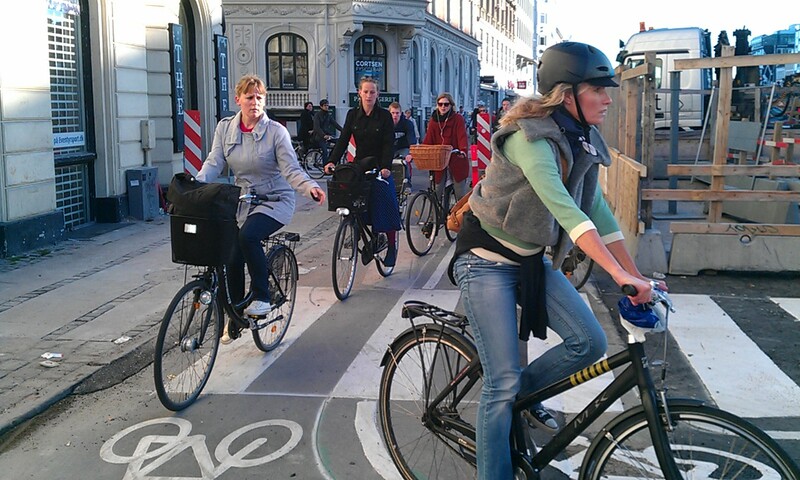 It also happens to make cycling practical and inviting for tourists! What a concept! 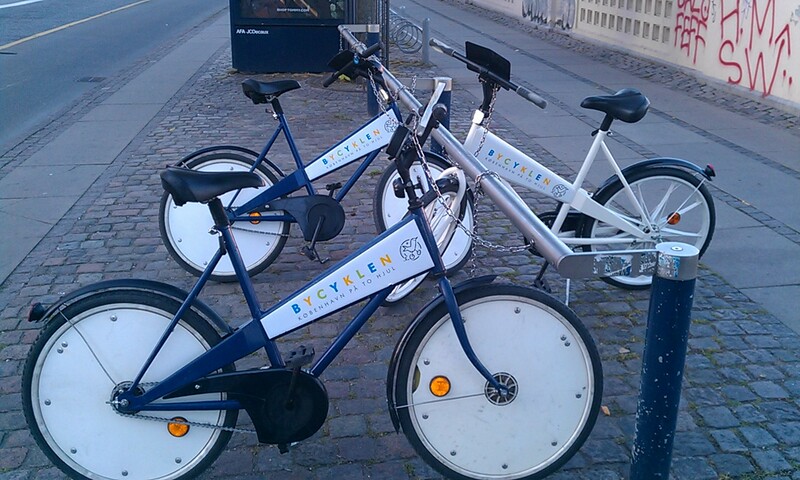 Copenhagen Free Bikes. Click to enlarge. Photo by Keith Hauser. They even offer free bikes for use by anyone. Just unclick and go. What else do we need to know? The examples here show what’s possible. And cities like Chicago are, in fact, beginning to move in this direction. The city already has miles of running and bike paths along its lakefront, and cities around the country seem to be following suit. 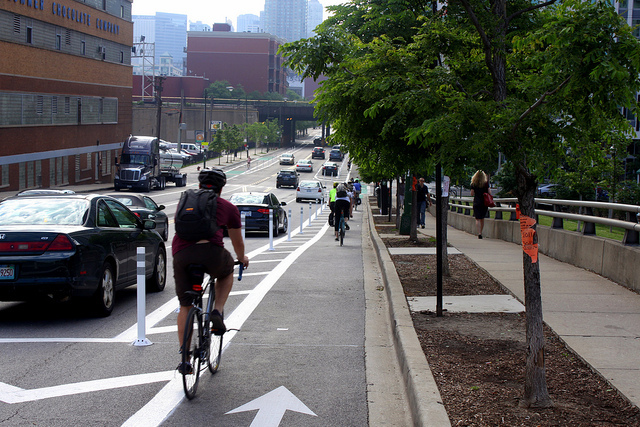 Chicago Bike Lanes. Click to enlarge view. Here in our little section of the world there are even plans to turn a landfill into a cycling and recreation center at Settler’s Hills Landfill. That means piles of garbage will be turned into place to run, bike and play. A good idea, no? This entry was posted in Uncategorized, We Run and Ride Every Day and tagged bicycle density, bicycle lanes, biek lanes, bike lock, bike racks, bike stands, Chicago, chicago bike lanes, Christian 3 wheel bikes, Christopher Cudworth, copenhagen, cycling safety, Denmark, double decker bike stands, Dutch, green city, League of Illinois Bicyclists, no baskets, no lights, no racks, old town, public bikes, sightseeing, sightseeing by bike, single speed, tourists, travel cycling, urban cycling, we run and ride. Bookmark the permalink.